This article is about the plant. For the four-leaved treasure, see Science Project. For the brooch treasure, see Crystal Clover. 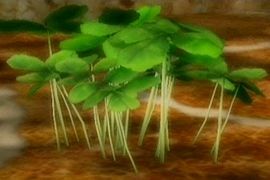 Clovers are small clusters of three-leaved plants used as scenery in all Pikmin games. They can be seen in numerous overworld locations, but are particularly common on "rest levels" inside several caves. In the first two games, although clovers do not directly affect gameplay, disturbing a clover patch can often scare Iridescent Flint Beetles out of hiding. Some small insects may also fly out. In Pikmin 3, leaders and Pikmin can hide under clovers and other tall plants. Finally, in Hey! Pikmin, the clovers in Downpour Thicket provide protection from the droplets of dew that fall from the sky. Clovers covered in dew in Hey! Pikmin. Fly-like insects flying around a few clovers in Pikmin. A group of clovers in Pikmin Adventure. A group of clovers covered in snow in Pikmin Adventure. Artwork for the clover in Pikmin.